This column focuses on service organizations in D.C. – what they do, their history and how you can volunteer. If you know of any service agencies in D.C. or have a place where you regularly volunteer, please share your experiences in the comments below and those agencies could be featured in this column. This week’s organization is Back on My Feet located at 122 C St., NW, Suite 240, Washington, DC 20001. Back on My Feet (BoMF) is a service organization that uses running to provide support and resources for currently homeless men and women. 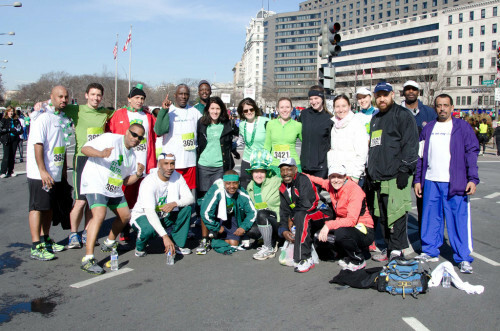 BoMF uses running to encourage those experiencing homelessness to gain confidence and use running as a healthy outlet. Back on My Feet’s hope is that through running as a team, participants will gain the skills and confidence to take steps to find a more permanent living situation and a job. BoMF has 10 chapters all over the country, including chapters in D.C. and Baltimore. BoMF works with local residential facilities (shelters, missions, halfway houses, etc.) that support homeless men and women to start “teams.” Teams are made up of volunteers, homeless men and woman, and BoMF representatives. These teams meet three times a week at 5:30 a.m. to go on runs together. All team members must sign a “Dedication Contract” committing to showing up for the runs, being on time, respecting themselves and supporting teammates. After thirty days in the program, participants who maintain a 90% attendance rate move to the “Next Steps” part of the program. In “Next Steps,” participants meet with a BoMF staff member to plan a road map to a better life. BoMF has financial aid for members to address barriers including tools for employment, education, security deposits, etc. Once participants find employment and housing they become alumni members, many of whom still join in on team runs. BoMF was founded in 2007 in Philadelphia by Anne Mahlum. As a teen, Mahlum used running to keep her mind off her father’s gambling addiction. She has continued running, and when Mahlum moved to Philadelphia she would often see homeless men and women on her morning runs. After passing the Sunday Breakfast Rescue Mission again and again, she formed a relationship with some of the men who stayed there. She contacted the Mission to see if these men could join her on the morning runs. Since then, BoMF has expanded to 10 cities, with two more planning to launch this year. Forty-six percent of participants in the program go on to find a job, housing or both. The goal of BoMF is not to make all participants marathon runners: participants set those goals for themselves. Instead, BoMF tries to instill self-worth in all the members and give them tools and resources to live a more healthy and sustainable lifestyle. You can volunteer with BoMF in many different ways. You can join one of the teams in your area and run three times a week at 5:30 am. In D.C., BoMF has teams at Blair House, Clean and Sober Streets, Emery House, La Casa and N Street Village. If 5:30 am is a bit too early, there are other ways to volunteer as a weekend runner, a team volunteer, a fundraiser or a supporter. Visit their website to sign up for an orientation for these opportunities. You can run a race and raise money for BoMF or volunteer at a race where BoMF has team members. All of these opportunities are available on their website or you can call the D.C. office to learn more at (202) 258-0832.